Home › Home and Kitchen › I-Pure Items Tm High Quality Instant Read Digital Food Thermometer With Colla..
I-Pure Items Tm High Quality Instant Read Digital Food Thermometer With Colla..
1.You can get an accurate interior temperature of food in 3 to 5 second, displayed on a clear digital screen. An incredible measuring range from -58F to 572F makes it perfect for various cuisine. The thermometer brings you the best kitchen experience to enjoy cooking. 2.Automatically off when the probe is folded. Electrically efficient and environmentally friendly by prolonging the usage of batteries. 3.Get rid of the complicated step to measure food's interior temperature. Just put your probe into the food, and you can get an accurate measurement of interior temperature. A chart printed on the device also provides you with the ideal temperature for different cuisine: steak, roasted chicken, pork, beef, etc. Just compare your measurement with the chart when you are cooking. 4.Portable and space saving. Not only a magnet at the back of the device makes it easy to be attached on your fridge door, but also a hook is added, so that you can hang it on your kitchen wall. The device is also designed to be extraordinarily portable, that you can even put it in your pocket and bring it to an outdoor barbeque. 5. Safe and secure: Food-grade ABS plastic case and stainless probe, certified by CE and ROSH.You may rest assured. Say goodbye to burnt or half-cooked food. 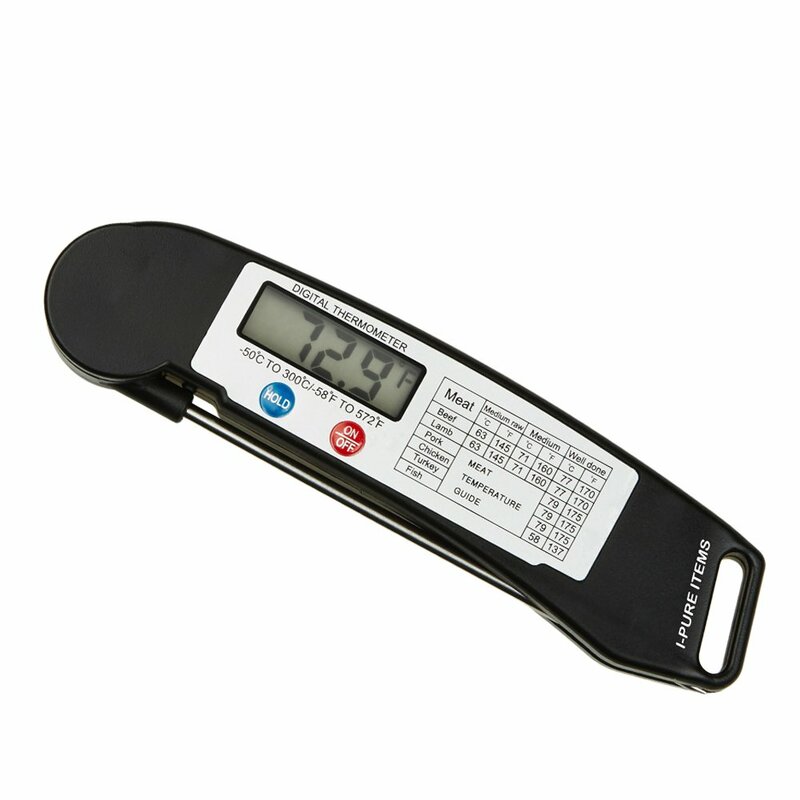 Our folding thermometer provides youwith an accurate measurement of interior temperature of food, and itsportability makes it convenient for both indoor cuisine and outdoor barbeque.Our product gives you a perfect experience of cooking. 1. Range ofMeasurements: -58~572℉ 2. Figure keeping function 3. Automatically off whennot used Instructions: 1. Remove the battery cover and insert an AAA batteryand replace the cover.（Please note： 1AAA battery is not included） 2. Move theprobe out, and the device will be activated. 3. Put the probe into the food'scentral part. 4. Click on the "Keep" button before remove the probe. Thefigure will remain on the screen until next click. 5. If no buttons areclicked for 10 minutes, the device will be turned off automatically. Guaranteeof customer satisfaction: make it the best present for families and friends.